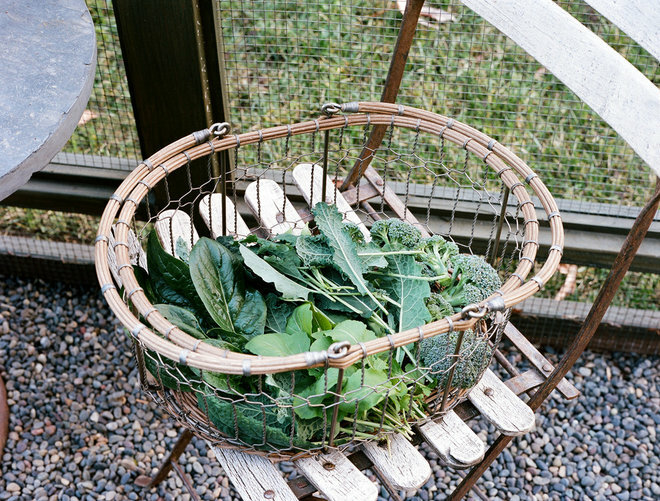 During this busy season, break down the daunting task of fall garden prep into smaller chunks. By doing so, you’ll reduce your environmental impact by recycling nutrients back into your soil while maintaining what you have. 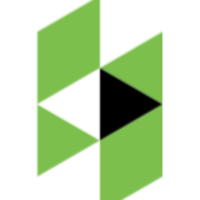 Additionally, you’ll have a garden that can revive itself during the slower winter months with minimum work on your part. Try these three important bite-size chores to get your garden and tools ready for fall and winter. I do these while I wait for my coffee to steep — five minutes — or for my boys to find their missing soccer cleats — 15 minutes to an entire afternoon. Compost piles are the Rumpelstiltskins of the garden, magically spinning dried straw, leaves and stems into gardener’s gold: compost rich in organic matter, moisture-retaining humus and nutrients that create healthy, strong plants and reduce the need for chemical fertilizers. Food scraps and yard waste make up 20 to 30 percent of what we throw into landfills, where they create toxic greenhouse gases. Instead of throwing away your dried leaves, collect them into a pile to turn into rich compost for your spring planting. Browns: Dead leaves, branches, twigs or other dried organic plant material. Greens: Grass clippings, old vegetable leaves, vegetables or “wet” organic plant material. Old seed heads: Save seeds from expired vegetables and flowers for next year. Green waste: Weeds, mildewed or diseased plants and other unwanted garden waste are set aside for the curbside pickup or green recycling team. This will prevent unwelcome seeds or disease from spreading throughout your garden when you use your finished compost. When we started composting, we didn’t have enough browns, which is a common problem. I would raid the huge piles of dried leaves in our neighborhood. If you do this, be sure to keep it nice and tidy for your neighbors who worked so hard to collect the leaves in the first place. Now that we have chickens, the wood shavings from our chicken coop go in the compost, since they have the added benefit of chicken manure, to start the compost process. If you’re low on greens, local coffee shops are happy to give away their bags of used coffee grounds so that they won’t go to waste. To create a quick compost pile that will break down during the winter, collect only the browns and greens, and stack them like a layer cake, lightly dampening each layer. A good size to start with is 3 feet by 3 feet by 3 feet (about 1 meter by 1 meter by 1 meter). There should be an equal amount (by weight) of browns and greens. Once you’ve started a compost pile, like the two seen at this urban farm, it will break down over the next few months with little maintenance. You can turn it every once in a while to aerate, or give your compost oxygen. If your area freezes during the winter, your compost pile will still continue to break down, though more slowly. The edges of the pile will be the same temperature as the environment. When spring comes, the edges will thaw and restart the decomposition process. Since our two piles are on dirt, the worms and bugs do the aerating for us as they dig through and break down the piles. When spring arrives, you should have a nice heap of rich compost for your spring planting. Garlic. This is an extremely easy crop to start in the fall, and when you plant garlic bulbs in autumn, they’re bigger and more flavorful when you harvest them the next summer. Garlic also is a natural pest repellent in the garden with few diseases once planted. Getting the bulbs is easy. 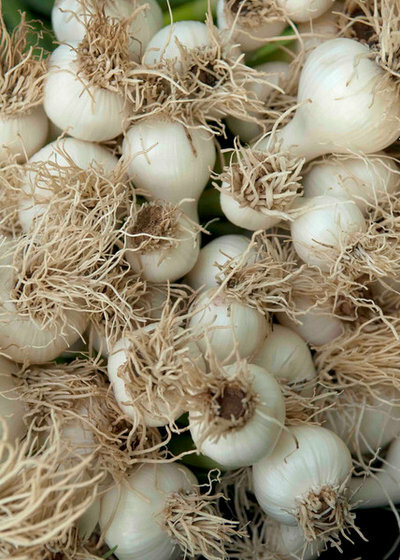 You can choose to go to a nursery; however, I pick up more interesting and flavorful whole garlic bulbs from farmers markets and grocery stores. Bulbs should be firm, organic and nonirradiated. Look for little roots at the bottom of the bulb. Wait until just before planting to break bulbs into cloves. Tuck the cloves into the ground 4 inches deep and 6 to 8 inches apart, with their pointed ends up. Our garlic manages to sprout, despite my spotty watering and California drought weather. In areas that get a hard frost, plant garlic six to eight weeks before your frost date. Fava beans. Also known as broad beans, favas are another easy, surefire crop to start in the fall. When I worked to help design and manage the Children’s Discovery Museum garden in San Jose, California, fava bean planting was a favorite activity. Everyone from toddlers to grandparents could push these large beans into the soil without special instructions or prep. Every spring, the fava beans would faithfully sprout and provide a crop. Fava beans are delicious, and they capture nitrogen in the environment and convert it to nitrogen as a nutrient for your garden. As a cover crop, they improve soil texture, suppress weeds and boost microbes in the earth. The best part? You get a beautiful crop of spinach-like leaves and nutty beans emerging from stalks of tiny orchid-shaped flowers. Take a handful of fava beans and push them an inch into the ground. It’s that easy. They’ll sprout within a week or so, regardless of how they’re put in the soil. I’ve seen the many creative ways kids have decided to plant these little seeds, and they seem to grow no matter what. 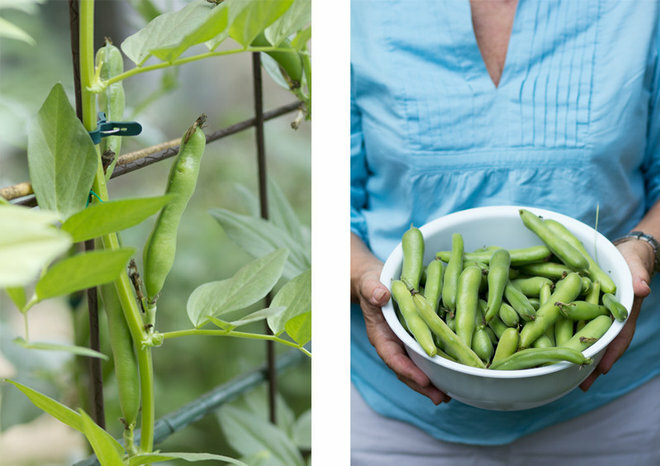 Now is the time to plant favas to enjoy a great harvest. Note: Fava beans are potentially dangerous to those who have a rare disease called favism, so be careful when consuming. You can find fava beans at any garden store. My favorite variety is ‘Grano Violetto’, an heirloom variety with fat purple beans instead of the usual chartreuse color. Pollinator cover crops. These serve the dual purpose of enriching soil while feeding bees and other pollinators during the lean winter months, when food is hard to come by for those little critters. The easiest of all cover crops is a pollinator mix that I can sprinkle on the soil. If you’re really strapped for time, there’s no need for rows or digging or even leveling dirt. I just grab a handful of seeds and throw them around like confetti, press them into the soft soil and moisten them with water. Sprinkle a bit of mulch on top to help anchor the smaller, lighter seeds that may blow away. Once they’ve grown, be sure to till these cover crops into the soil two to three weeks before spring planting so that the plants have time to decompose and build up your soil. 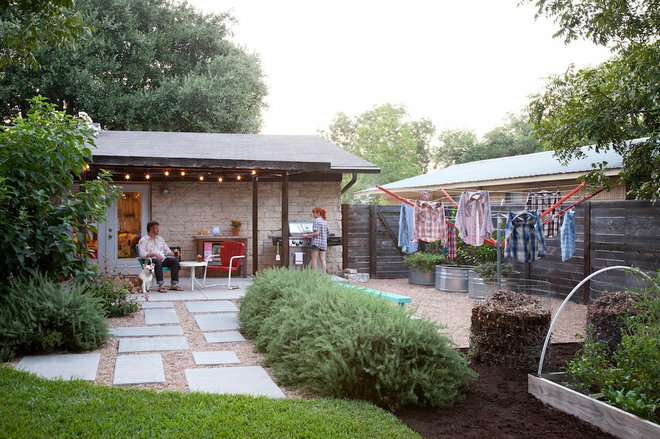 Rinse off the dirt from garden tools. If needed, grab a cloth and wipe the dirt from hinges and blades. Mix a bucket of sand with oil (mineral oil, baby oil or any other nontoxic oil) until the sand is just moist. I’ve read that some people use motor oil to prevent rust, but putting toxic chemicals into my garden soil sounds like a bad idea. Push the blades of your shovels, pruners, hand tools and so forth into the soil to sharpen them and to oil the metal and keep it from rusting. You can plunge the tools into the soil up and down to further scrape and file the edges. Use this self-cleaning and sharpening garden tool bucket throughout the year. 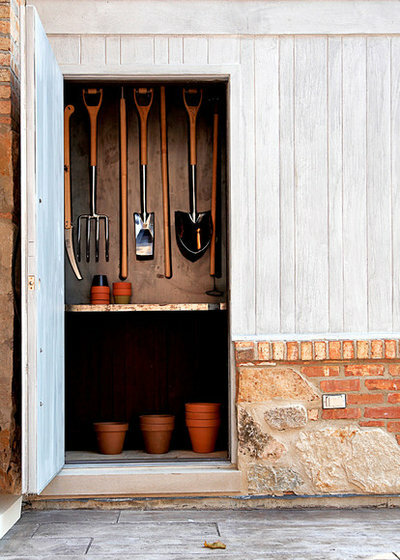 Just rinse your tools after gardening and stick them in the bucket to keep them clean and maintained every day. By tackling these chores, you’ll reduce your climate impact by recycling nutrients back into your soil and maintaining what you have. You’ll also set yourself up for success in spring — with a couple of vegetables to harvest as well. In addition, should you find a great lettuce or kale or winter vegetable you’d like to pop into the ground, your garden will be prepped and ready.